DPx5 Sewing Machine needles $18.25 per box of 100 Needles. 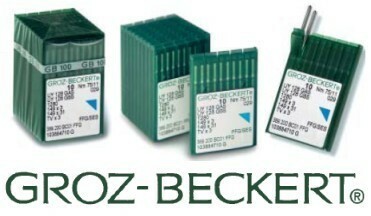 Groz-Beckert® 135X5 needles are available in following sizes. Size 10 (Metric Size 70) for light fabrics. Size 11 (Metric Size 75) for light fabrics. Size 12 (Metric Size 80) for light to medium fabrics. Size 14 (Metric Size 90) for medium weight fabrics. Size 16 (Metric Size 100) for medium-heavy fabrics. Size 18 (Metric Size 110) for heavy fabrics. Size 19 (Metric Size 120) for heavy fabrics. Size 20 (Metric Size 125) for heavy fabrics. Size 21 (Metric Size 130) for heavy to extra heavy fabrics. Size 22 (Metric Size 140) for heavy to extra heavy fabrics. Size 23 (Metric Size 160) for extra heavy fabrics & Thread. Size 24 (Metric Size 180) for extra heavy fabrics & Thread. Fits many long-arm quilting industrial machines. For use with HANDI QUILTER.